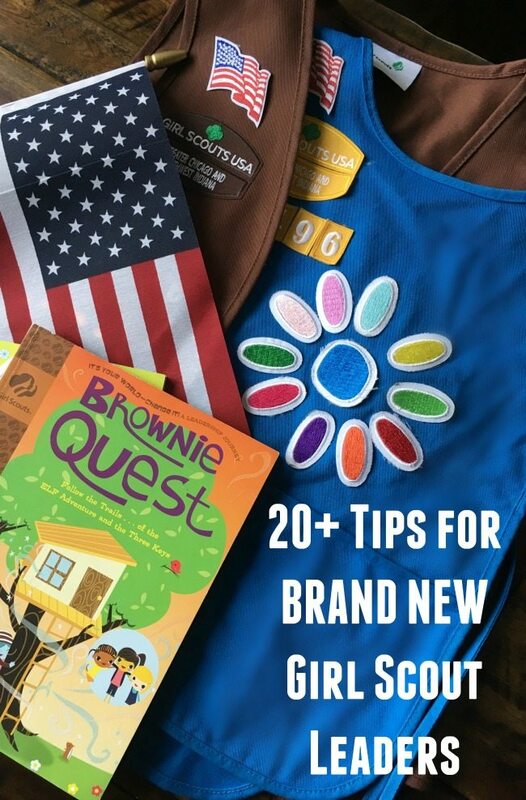 Inside: Get ideas and tips for new girl scout leaders from a troop leader who was recently in your shoes. Navigating the girl scout system can be overwhelming, try these tips to get started. I'm including a few affiliate links to helpful products as well. 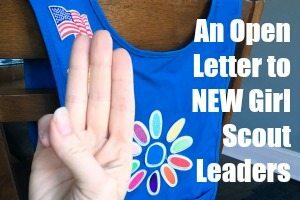 As you might have read in my Open Letter to New Girl Scout Leaders, I am one year into my leadership journey. As a brand new girl scout leader, whether you have had a deep-seeded desire to be a troop leader, or accidentally fell into it like I did, there is a lot of information thrown at you all at once. Seasoned scout leaders who know the system inside and out can sound like they are speaking in a foreign language to those of us who have yet to complete our first meeting. The day I found out I'd be a leader I was given multiple binders, notebooks and websites as well as blank forms and a list of families to contact. I think there was a checklist for new leaders somewhere in there. I had no idea what patches we should earn, or what patches were even available, let alone how to plan a meeting or how to handle troop money and forms. But guess what? We made it. Through a year! And it turns out it doesn't need to be as daunting as I felt it was going to be. Here, in very random order, are tips for new girl scout leaders and other things I wish I had known last year. 1. As a Daisy leader, our saving grace was the Petal program. Our troop met 2 Mondays a week, after school with a few field trips here and there. We started as first grade daisies so we had a lot to do in one year. The Daisy program, in hindsight is a great entryway for new leaders. It is fairly straightforward, with one path to choose. If you are a new Daisy Leader, and you are feeling overwhelmed, take one day and just look through the petals sheet in the blue Daisy binder. This can lay out every meeting for you if you want. If you started as a Kindergarten troop, split it in half and aim for half this year and half next. 2. 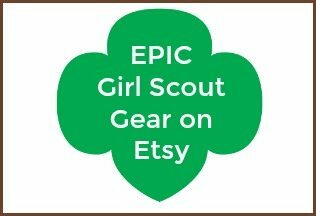 I put together a list of ways to earn the Daisy Girl Scout Promise Center last year, in case it helps anyone get started! 3. To fill in the gaps, ask your girls what activities they participate in, and see if any can invite the instructor in for a demo for one meeting. Some parents may have special skills or hobbies that can contribute to one meeting or patch. 4. When you found out you were a troop leader, amongst the stacks of binders and notebooks you might have heard mention of the Volunteer Toolkit. Each council has it set up a little differently but I'm going to link to the one I have access to because it features a video that explains the toolkit as well as a quick training video. Volunteer Toolkit. After you see the video, if you're interested in using it, ask your council leader for the link to yours. Basically it is an online planner that lets you plan your year, including meeting plans for each patch. :O I KNOW, RIGHT?! 5. When it comes to organizing the back end of things, you can do a lot of your financials and even troop emails in the Volunteer toolkit as well. You can set meeting reminders too. That is one option. Last year, just to let you know you don't have to be perfect- I kept all our forms and rosters and information in one binder, not organized in any specific manner. We made it through- hooray! 6. This year I created a Google Drive Folder that all our parents could access. I add the link to it in every email. It has copies of forms for the beginning of the year, a troop roster, lists of upcoming events and a photo of where all the patches go. You could go this route or a paper file or troop binder. 7. For Daisy uniforms, we all chose the tunic style with the pocket in front rather than the vest. This pocket came in handy for events like parades and Christmas caroling. Most of the photos you see of Daisy vests and tunics show them with all the petals on it. To begin the year though, the petals are not on there yet. Here is an example of what your scouts need on their vest to begin the year. 8. If you have two years of daisies be sure to get the tunic in a size that will still fit after two years, and consider if they will be wearing them outside their coats in winter. 9. Adhering patches: One of my friends told me that although many patches are iron-on, that the ironing process doesn't always hold for the whole year. There are also these sheets of sticky material called Badge Magic, it's basically like double sided glue paper. You cut it out in the shape of the patch and press down hard on it for a couple minutes to make it stick. She told me she would cut them out before each meeting, while watching TV, then adhere one side to all the girl's patches for the upcoming meeting and pop them right onto their vests at the end of the meetings. I used it last year, and it was kind of a pain to cut all the shapes but they stayed on longer. One of my girls this year used it on patches at the top back of her vest this year and says her daughter's hair gets stuck in it once and a while. I think this year I'm going to iron them on and then stitch like one or two stitches with a needle and thread at each corner. A Kaper chart is a chart where you give each scout a job or task for that day's meeting. If you have a small troop, each girl can have one job. If you have a larger troop some girls may not have a job every meeting, or they can be on teams. Some examples of tasks are snack assistant, cleanup squad, craft assistant. Last year we had a one page laminated kaper chart, which had leaves with various titles like “Queen of Clean” “Snack Lady” etc. Then I punched out flower shapes and added one girls name to each flower. Each flower was glued to a clothes pin and we just clipped them to the page. However, since it got jammed into my bag over and over, we lost clothes pins, flowers popped off and in the end we had half a Kaper chart. I just found a bunch of Kaper Chart Ideas online and picked enough jobs to suit our troop, not knowing how it would play out. If you have a space to store your troop belongings, and your Kaper chart will be relatively unscathed, then feel free to get creative and make a fun big tri-fold kaper chart. Here are like a billion ideas for big fancy kaper charts on Google. For us, we bring our belongings back and forth to each meeting so I needed something portable and durable without pieces to lose. 11. This year I went with a simple job wheel. 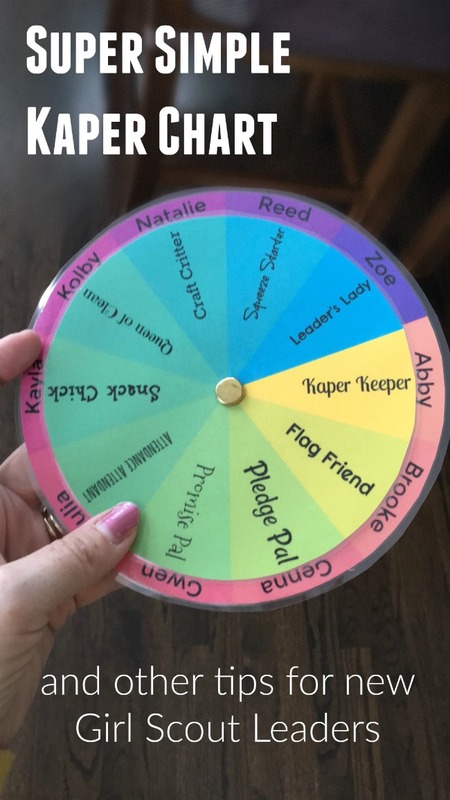 If you're already overwhelmed by everything and you want a small, portable, simple Kaper chart, here is what we did for our first year of Brownies. 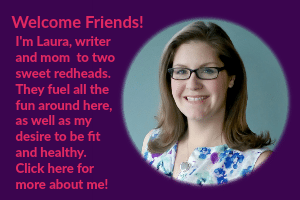 I used a website called Canva to make two pie charts, then used Picmonkey to add the words. I printed them, laminated them and added a metal brad. You don't need those websites, but you can use them if you are familiar with them. Microsoft and mac programs also have the ability to add a pie chart to documents, even if you print out blank pie charts and then add the words it will still work. Obviously you can also draw your own. I made up the job names, they are not official or anything. I listed them in the order that they come up in our meetings, and set the position based on who brought the snack. 12. Kaper Chart Job Ideas: The Kaper Keeper holds onto the Kaper Chart and tells everyone their job. The Pledge Pal leads us in the pledge while the Flag Friend holds a small American flag (which we totally never did during our first year). The promise pal leads us in the promise, then the attendance attendant takes attendance on a list of names. Snack chick hands out the snack and while they eat, the leaders talk to the girls or read from the binder about what we are doing for the meeting. The queen of clean is the primary snack cleaner, but we all pitch in. The craft critter helps set up any craft or activity. The craft critter, queen of clean and leader's lady are supposed to help clean up after the activity. The squeeze starter is the person who gives the first squeeze on the Friendship Circle that ends our meeting. The Leaders's lady is an extra helper who would be the sub if one of the other girls misses the meeting. Whatever format you choose, I totally prefer to keep it simple and move on. If you're feeling crafty, then craft it up! 13. One of the expectations that my girls had was to go camping together. I was not up for camping overnight with Daisies. Don't let my example stop you if you are excited about it. But if you are not up for the overnight camping experience, check your local girl scout programs website for afternoon camp events. The camp staff runs the whole thing, and you and the girls just do what they say. It was a really fun way to get to experience camp without doing an overnight. We did ours towards the end of the school year but check the program site often to see what dates fit for your troop. 14. A friend of mine in a different area council said that cookie sales are optional for Daisies but it didn't seem to be optional in our area. Check with your Area Council contact for your specifics. 15. I was told early on to find a parent in my troop to be the Cookie Parent. This person handles all the online ordering (as a troop you need to tally all your orders for each cookie type, and order by the case rather than individual boxes of cookies), taking cookie delivery for the troop and disseminating the cookies to each girl who then hands them out to the people who bought them. They also request the awards and rewards earned by the girls based on their cookie sales. I was super lucky to have a mom volunteer for this. 16. Depending on your geographic location you may or may not have access to online cookie sales. I was told that, typically rural troops have access to online cookie sales whereas urban and larger suburban areas don't because they have access to a larger population of buyers. Find out before sales start if you have access to online sales. 17. I wish I had handed out the girls cookie packets before winter break so they could be ready to roll as soon as the cookie sales began. I was such a deer in headlights last year that I didn't get the packets out until right before sales started. 18. I would also schedule the last meeting before cookie sales to actually talk about it to the girls, versus just hand the packets apologetically to the parents, firmly believing they would be doing all the sales. 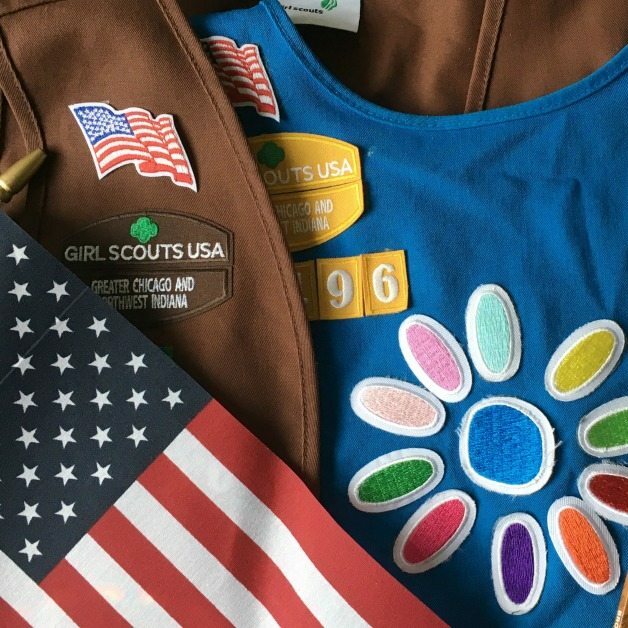 I didn't realize it in time last year, but there are leaves in the daisy program and patches in the brownie program that introduce the girls to concepts like financial responsibility and working with customers. If you have a chance to cover one before cookie sales, it would help the girls become more deeply involved. 19. Oh if you have leftover cookies that your troop cannot sell, consider using them for a cookie decorating meeting, end of year party, Bridging ceremony, welcome back party for next year or some other troop event. As a Brownie Leader this year, I feel like I found myself back at square one, trying to navigate a system that is totally foreign to me. Instead of having one path set out for us, we had all these extra booklets and packets available. 20. I'm a visual person so I refer to this “What Brownies Do” flyer, which was in my brown Brownie Girl Scout Guide. It shows you which patches are covered by which girl scout manual. Once I saw that What Brownies Do thing, it helped me understand where to find things. This year we are focusing mainly on the Legacy patches, on the right side, which are included in the brown binder. We are also doing a couple individual patches from the center column. On the left side of that flyer are Journeys which are patches that are earned all together that culminate with a journey award. 22. If you want to do a patch for which you do not have the binder insert, or which is in a guide that you don't own, ask your service area leader, she may have resources from last year's leaders which she can pass onto you. 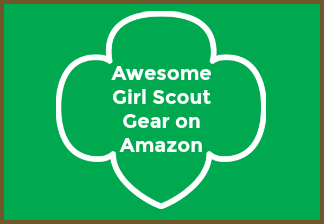 You can also buy them from the girl scout store or google “brownie girl scout painting badge requirements PDF” and see if you can find the requirements online. 23. This Badge Explorer website gives you the shortest, bullet pointed list of requirements for each patch. I find I need more details than it provides but for planning purposes it helps me to be able to flip quickly through badges. My co-leader and I still feel like we are flying by the seats of our pants this year, but I am really working on apologizing less and enjoying our time together more. 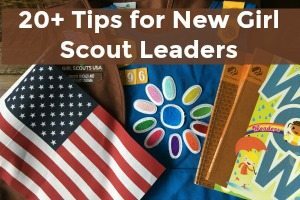 I hope some of these tips for new girl scout leaders help you, and if you have any tips to help new leaders, or something you needed translated, please feel free to comment below, you will surely help other leaders out there! Well-written, and exactly our experience last year! Glad you had the time to write this, it will definitely help the next deer-in-the-headlights last-minute troop leader ;).